Across the street in front of 1 West 192nd street at night. Our house at 2 West was almost all Jewish and 1 West was almost all Irish. Every Friday night the fund raisers hit all the bars for the IRA! My brother Paul Roth hamming it up on Jerome Avenue in 1959. You can see the Kingsbridge Station of the El in the middle in the back on the left and of course beautiful St. James Park right across the street. Paul is right in front of Louis Gelfand's candy store (egg creams, malteds). The Willis Theater on Willis Ave, the Bronx. This photo was taken c. 1924 by Michael Wickham, a recent immigrant from Ireland, who lived at 372 E. 141 Street. The movie playing is "The Signal Tower" with Wallace Beery. This is Van Cortlandt Park taken from the Amalagmated House on Van Cortlandt Park South. The photographer was Carl Jaslowitz, formerly of the Bronx. My dad, Arthur, and me standing in front of 1423 Bryant Avenue in the Bronx in 1948. 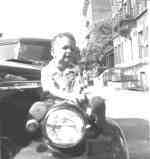 Me sitting on an old car in 1948 in front of 1423 Bryant Avenue. This is Unionport Road, one of the main thoroughfares in Parkchester, taken in the early 1940s. The entrance to 1525 Unionport Road is right next to the Chester House Tap Room. Cushman's Bakery is also evident. The store at the end of the row on the left was the Laundromat. This photo, one of three taken by my brother Owen Kaminoff in 1968, is looking west on 170th Street from the Grand Concourse. This was taken on 171st Street looking west toward Jerome Avenue during a garbage strike in 1968.